Description Combine multiple 2D or 3D volumes into a single 3D volume. 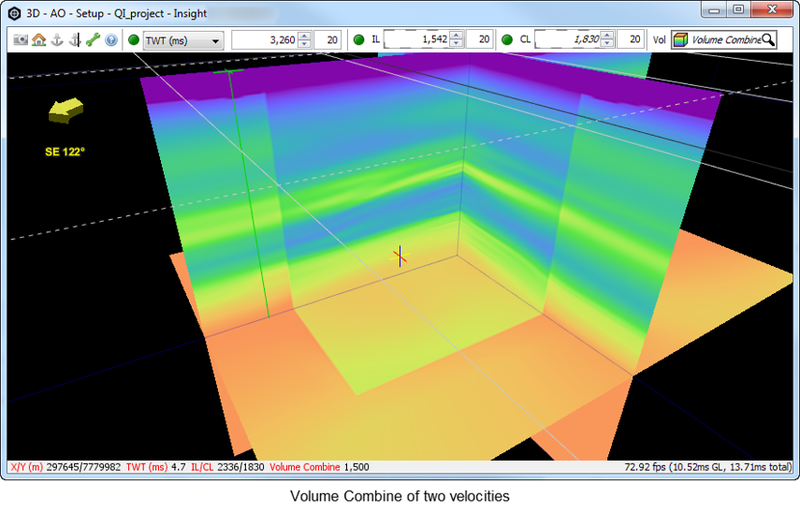 Volume combine creates a single 3D volume by spatially merging a list of of 2D or 3D volumes. By default, the output extents cover all the input volumes. Output must be made onto a 3D survey. All input volumes must have the same vertical sampling and extents, i.e. they must begin and end at the same time or depth with the same sample interval. Note: The volume combine process does not merge gather volumes. To combine gather volumes, use the merge (v1, v2,...) function in Volume maths. Where data overlaps, traces are output from the volumes in the order they are listed. In the Details Panel, select the volumes to be combined in the Input Volumes section. To add more volumes, click the Add icon. Conversely, click the Remove Row icon to remove a volume. For every volume, you can rearrange the order in the list by clicking the left side of the volume and dragging it up/down. The list is based on decreasing priority, which means during processing of each location, the first volume in the list to return a trace will generate the output trace. Note: All the input volumes must have the same vertical sampling and sample interval. Use the Volume Resampling process if necessary. 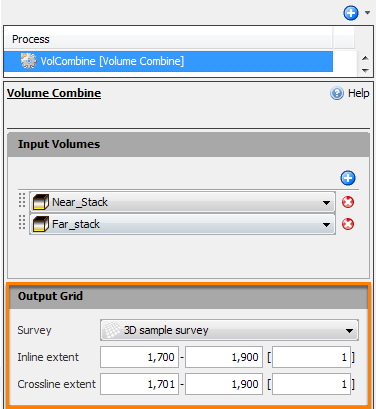 At Survey in the Output Grid section, select a 3D survey based on which the volumes will be combined (2D surveys will NOT be available in the drop-down list as an option). Type the range of Inline extent and Crossline extent for the output of the volume combine process and the respective sample intervals. 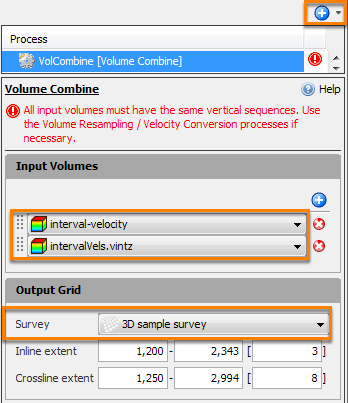 If you have multiple velocities across multiple surveys, the Volume Combine process can combine the velocities into a single volume for time/depth conversion and to assign it to a particular output survey. At the Process tab header, click the Add icon and select New Process. 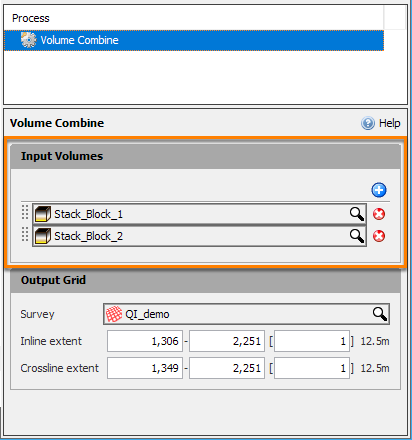 Double-click on Volume Combine to create a new Volume Combine process. In the Details Panel, select the velocities to be combined in the Input Volumes section. To add more velocities, click the Add Row icon. Conversely, click the Remove Row icon to remove a velocity. You can rearrange the order in the list by clicking the left side of the velocity volume and dragging it up/down. The order of the volumes listed is the order of precedence. At Survey in the Output Grid section, select the survey which the velocities will be assigned. Note: All velocity volumes must have the same velocity type and units. If you get an error like the above (! ), use the Velocity Conversion process. 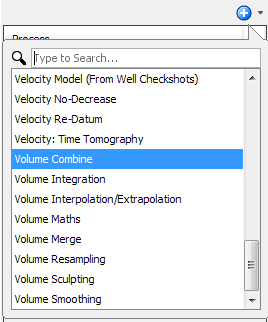 After creating the Velocity Combine, use the resulting output volume as your time/depth conversion volume (see Converting Time-Depth). Once you have defined all these settings, Insight will perform real-time conversion of time/depth as you switch between the two horizontal slices in all the views. To switch to using another velocity for a particular survey, simply return to the Volume Combine process and change the Input Volumes or the Survey in the Output Grid.